I meant to include this in my earlier blog post – but will now give it its own space, as it’s wonderful! Tim the Swim, one of our core customers since the early days in the old premises, found this lovely card, designed by Fiona Hart, and gave it to me as a Christmas card. It is perfect! I will get a frame for it. We’ve been having fun deciding which character represents the regulars. I think that’s me sitting on the balcony on the left in blue…though it looks more like Hillary Clinton. Tom the Philosopher and Vicki on the right in yellow and red. John Who Sang In Swedish with the telescope, though that may be a girl. John could get away with a dress though. India in the tyre swing, Angela sitting on the branch above her… Tomorrow they’ll all look like someone else. Anyway – Happy New Year! 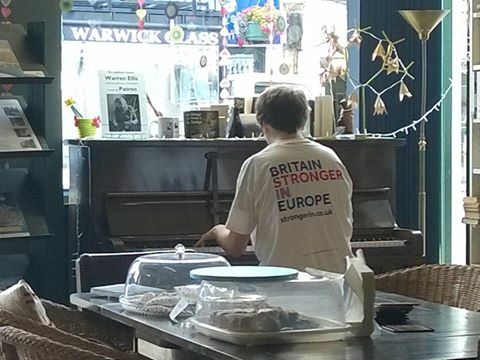 Local music legend Will Pound playing our piano during the lead-up to the EU referendum. There is always a tendency to take stock at New Year – to look both backwards and forwards, to be a bit reflective. 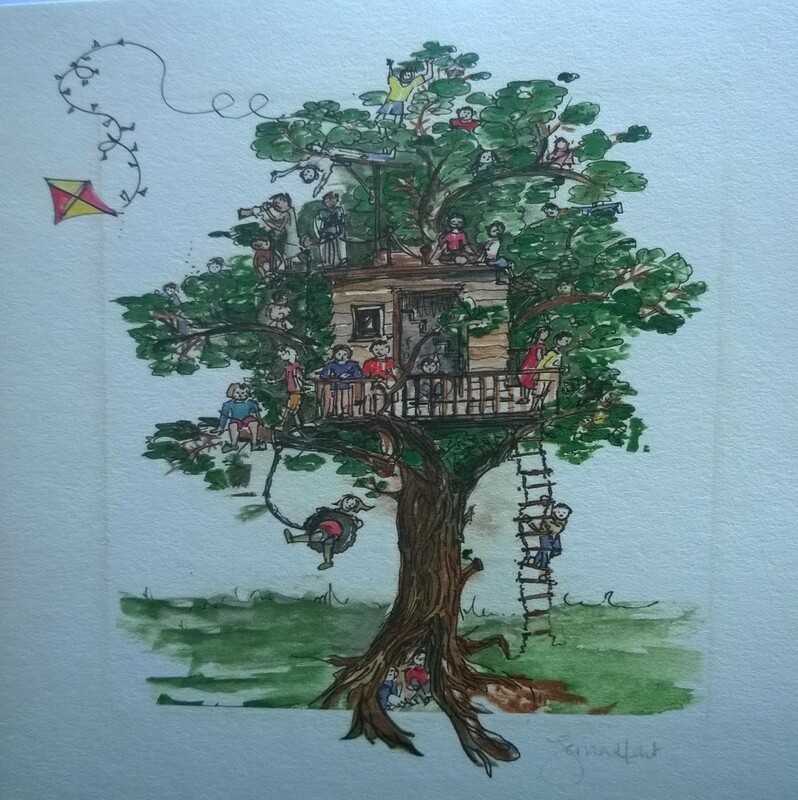 Though I have to say that I am pretty much always reflective about the Tree House, trying to work out what is going well, what could be improved, what isn’t working, what the best way forward is. We have been in business for three and a half years now, which feels like an achievement – one friend says he gave us about three weeks when we started! It’s always going to be tough financially. We are not a very commercial outfit, and I am not by any stretch a natural businesswoman. But finances aside, I think the achievements of the bookshop are enormous. These are all to do with people – the regular customers and volunteers who are part of the place, some of them since the day we opened, and the growing community of followers around the world, the connections via social media, the fact that we are an easygoing space in a pressurised world. That’s a direct result of not being commercially-focused…and yet we do have to survive financially, which is not easy. Our customer-base is very varied in terms of age, background, nationality. We really don’t have either a target market nor a typical customer. Even an interest in books is not always a factor – partly because we do other things here, partly because sometimes people come just because they like the atmosphere. One thing I love about it is how international our broader community is. Lots of European nationals, especially, who are among the regular faces we see. Being close to Warwick and Coventry Universities undoubtedly helps with this. The day after the EU referendum vote, when many of us were feeling hollow and a bit desperate, some of these European nationals came to the bookshop to talk, be with sympathetic souls and generally try to find some sort of solidarity and sense of community with others. We had made no secret of our desire to Remain in Europe, and we continue to promote a sense of Europeanness in what we do. That’s why when, at a recent Tree House Session (our regular open mic sessions), John decided to sing Santa Lucia in Swedish, unaccompanied, I was fighting back the tears, not always successfully, and not in sadness so much as pride. It was wonderful. John is one of the most solidly loyal members of our community and a regular contributor at the open mics, usually with his own poetry. He has lived in Sweden and has long been advocating that we create a more hyggelig atmosphere here – I know hygge is a Danish concept, but it is part of Swedish culture too. I love all things Scandinavian – I am a true northerner, give me snow over sun-baked olive groves any day! Anyway…we are now facing our toughest challenges yet, and who knows if we will get through them. If we don’t, that’s fine, I will find a new direction. But that moment on a dark December night at our open mic session summed up for me what is at the core of the spirit of the Tree House. It is and always has been about people coming together through a love of the arts, especially literature but also music (very much) and film and a celebration of creativity. But it’s also about deeper things, things we can’t always put into words, things that run through our collective identity as a community. It’s one of my favourite things that’s happened at the Tree House, John singing unaccompanied in Swedish.